I'm always looking for additional and better ways to carry and protect my gear. The Lowepro Slingshot cases have quickly become very popular, so I tried all three models currently in the line to find out if they were for me. Over the last several months, I've been using them along with the Lowepro Toploaders that I most frequently use (at least at this time) for my light gear needs. The Lowepro Slingshot 100 AW is currently the smallest of the Slingshot models. Characteristic of a sling type of case is the single padded and liberally adjustable shoulder strap that goes over the head and hangs on a shoulder. The Slingshots are designed to hang from the right shoulder. An additional strap and clip under the right arm optionally secure the case while it is in the on-the-back position. A handle is provided for carrying the Slingshot off-the-shoulder. To access the case contents, unclip the small strap (if you are using it) and rotate the case and shoulder strap down under the left arm until it is easily accessible in front. At this point, a double-pull zipper will open to access only the side of the case which is pointing up - similar to how a Toploader is accessed - with the lid opening away. Unclipping two clips will allow the same double-pull zipper to continue until the entire flap opens - as is shown below. You don't want the bag hanging from your shoulder with a fully open main compartment as the gear is at high risk of falling out - the clips for preventing this from accidentally happening are a good idea. The Lowepro Slingshot 100 AW is shown above with a near-largest camera and typical lens combination that fit in the designed location. This a Canon body without a grip (the Canon EOS 30D Digital SLR) with a Canon EF-S 18-55mm f/3.5-5.6 II Lens attached (sans lens hood). A lens up to 3" x 4" (75mm x 100mm) (dxl) would fit, but the hood for most larger lenses will not fit in the main mounted-lens space. Outside dimensions without the strap are 17" long, 10" wide and 6.5" deep (430mm x 255mm x 165mm). The main storage compartment is 9.5" wide, 8" high and 4" deep (235mm x 200mm x 100mm). Divider pads in the main compartment are held in place by strong hook-and-loop fasteners and are reconfigurable (one is shown removed above). Because of the small size of the case, there are not many alternatives to the as-received format shown above without changing the basic way the case is designed to work. The small divided section on the left measures 3" x 3.5" (75mm x 90mm) (wxh) and the large divided section measures 2.5" x 5.5" (65mm x 140mm). You could get two or three very small lenses into these sections, but there is less-than-adequate room for most lens hoods. 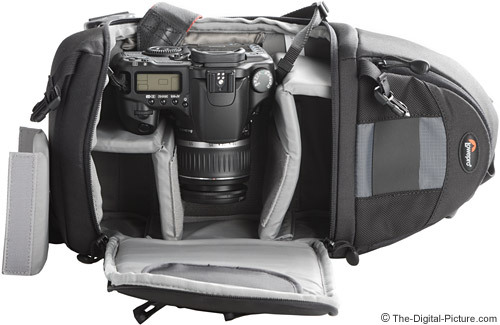 You could of course store any camera or non-camera accessory here that fits - such as sunglasses in a case. I should also note that, since the case is somewhat flexible, you can stretch the dimensions I provided somewhat. Additional storage is provided under the zipped-closed area on the right side (as pictured above) of the case. It measures 6" x 7" (150mm x 175mm), but the depth and width are tapered strongly toward the narrow end of the case - from 4.5" (100mm) down to 2.5" (65mm) in depth.. You could store hoods here, but allowing a little more room in the space designed for lens storage would have made more sense to me. A hook-and-loop-closed flap on the inside of the large lid opens to numerous CompactFlash-sized compartments. A zippered pocket on the outside of the main lid also has a few small slots for storing small things. There are two small elastic-closed pouches - one in each of the larger compartments. The one in the main storage section is behind the camera body in the above picture - this one has a lens cloth sewn into it. 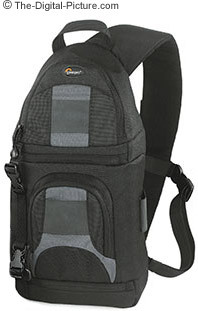 Three external SlipLock attachments are provided - one can be seen to the left side of the Lowepro logo in the picture above, another is on the lid shown opened in the same picture. The third is under the case as pictured above. 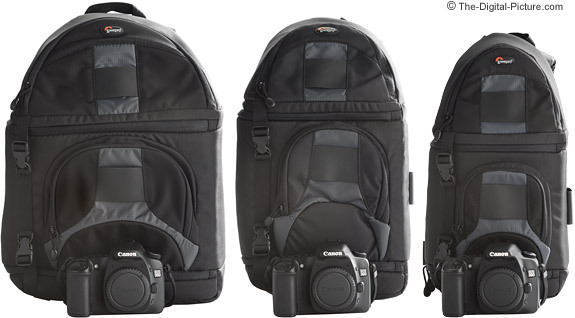 Lowepro provides many pouches, lens cases ... that can be attached here. When the case is on your back, these attachments will be upright - but they will be sideways when accessing the case hanging on your shoulder. The AW portion of the product name refers to the "All Weather" protection provided by a just-the-right-size rain jacket stored under the padded section of the back of the case and held in place by hook-and-loop fastener. Pull it out when needed. The rain jacket is of course for the case - not you. The Lowepro Slingshot 100 AW pads and the case itself are very protective - very typical for Lowepro gear. Quality construction is also typical Lowepro. The external material is a strong, durable Nylon. The case itself is very light. The Slingshot 100 is comfortable to carry even when fully loaded (the small size does not allow a too-burdensome load to be created). Your back is treated to a thick pad that very adequately insulates your body from the camera body. The small case size makes it easy to navigate forests and crowds of people while wearing the pack. Accessing the camera is fast and easy - the case works as designed. There is not much room for fingers to hook onto the grip of the 30D body with the lid only partially opened (as is typical for quick access in the field). I didn't find this to be a big problem, but a little more room would be welcomed and would make access easier for a 20D/30D/40D class DSLR. For my personal needs, the Lowepro Slingshot 100 AW is too small. But, for someone carrying a small camera+lens combination and some other small accessories, the Slingshot 100 could be just right.